Tag line: "WARNING: Contains Graphic Horror!" On their own, trailer compilations can be a lot of fun (all 5 volumes of the 42nd Street Forever series are an absolute blast). Mad Ron’s Prevues from Hell, a 1987 straight-to-video production, ups the ante by throwing in a couple of hosts, who, after taking over a movie theater, invite a few of their undead friends in to check out some blood-soaked horror trailers. Shot on-location at the historic Lansdowne Theater in Lansdowne, PA (according to Google Maps, it’s a scant 37 miles from my house), Mad Ron’s Prevues From Hell features Nick (Nick Pawlow) and Happy Goldsplatt (Nick’s ventriloquist’s dummy, which also happens to be a zombie), who, from the safety of the projection booth, watch a series of horror trailers from the ‘60s, ‘70s and ‘80s. But they aren’t alone; joining them is a gang of the living dead, who stumbled into the theater and are sitting in the seats below. As long as the projectionist, the rabies-infested Mad Ron (Ron Roccia), keeps the trailers coming, the zombies in attendance are content to sit quietly and enjoy the show. But what’s going to happen to Nick and Mad Ron when the previews are over? While the trailers remain the focal point of Mad Ron’s Prevues from Hell, the live-action sequences inject a sense of fun into the proceedings. The scenes starring Nick and Happy are, at times, entertaining (though Nick’s ventriloquism leaves something to be desired), but it’s the living dead who steal the show. In the opening moments of Mad Ron’s Prevues From Hell, a couple of these undead flesh-eaters shuffle into the theater’s lobby, where, after scaring the crap out of themselves (they saw their reflections in a mirror), they mosey on over to the snack stand for some popcorn (seasoned with blood instead of butter). For such a zero-budget production, the zombie make-up is pretty darn good, and even though these sequences are played primarily for laughs, there are a few gross-out moments as well (while watching the previews, one zombie reaches over and pulls out the eyeball of the ghoul sitting next to him, then proceeds to eat it). As for the trailers, Mad Ron’s Prevues From Hell has assembled quite an impressive collection, including classics (The Texas Chain Saw Massacre, The Last House on the Left, Brian DePalma’s Sisters), low budget affairs (several Herschell Gordon Lewis films, like The Wizard of Gore and Two Thousand Maniacs, made the cut), and a whole lot of exploitation sleaze (Ilsa, She-Wolf of the SS, Three on a Meathook, I Drink Your Blood). As with any good trailer compilation, Mad Ron’s Prevues From Hell even turned me on to a few movies I haven’t seen, but now want to, including Lady Frankenstein (starring Joseph Cotton and Rosalb Neri) and Vault of Horror (which has a great tagline: “All the things that make life worth leaving”). 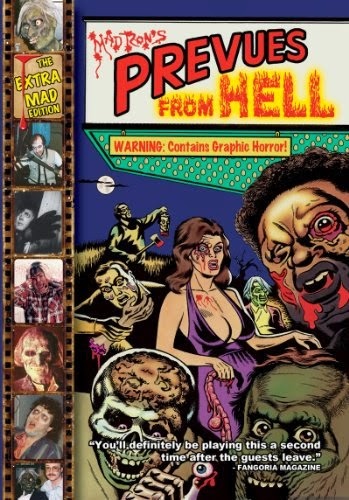 Grindhouse-era horror trailers and ‘80s video cheese? What’s not to love about Mad Ron’s Prevues from Hell?